I still need to correct the image heading of the "Generations" screen cap because it shows the 6ft model again (obviously, because there are no raised panels visible). 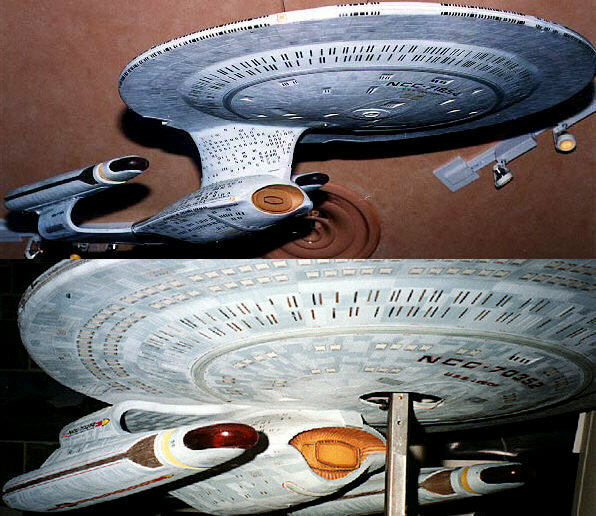 However, as the model was almost always filmed upside down, we rarely see the top of the saucer or a head-on view of the ship. 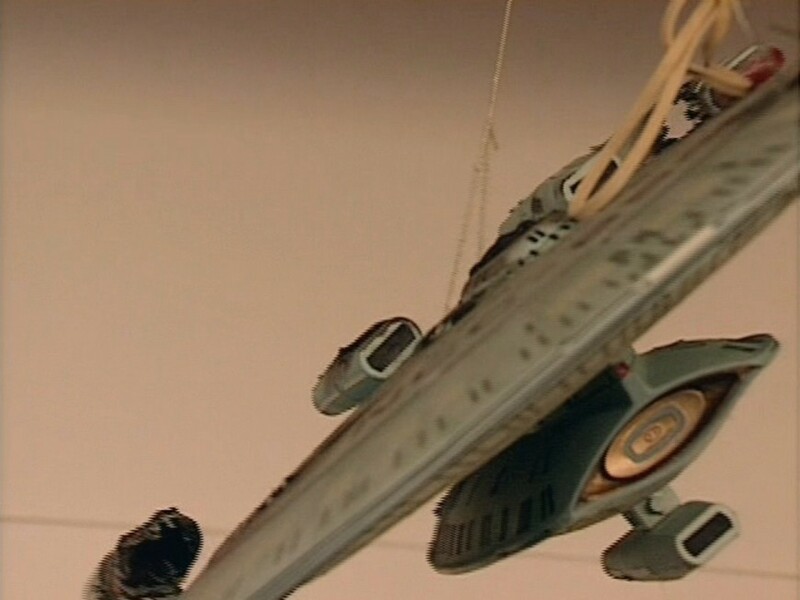 I sifted throught the episode screen caps at TrekCore but found only some small views of either the old 6ft or the new 4ft model. The one from "The Big Good-Bye" seems to be the best by far. Maybe someone remembers a great top or front view of the ship? Also, while it is obvious that two different heights of the rim exist (its height has doubled on the 4ft model relative to the 6ft model), I am not so sure about the Nebula class any longer. Update: I have added several pictures and corrected a few things. I read your article yesterday and was surprised at how much of a discrepancy there is between the different models. I suppose I'd always been peripherally aware that the 4 ft was bumpier, but I hadn't paid enough interest to see what exactly was going on there. Anyway, I don't think this is quite what you're looking for, but I know that every resource can be helpful in putting together a picture of how a physical object is constructed. I found this photo a while ago on Flickr and haven't seen it anywhere else. Could do with being sharper, but maybe you can glean something from it. Just a thought, but could Probert's "saucer rim/Observation corridor" concept live on in the likes of the Cheyenne and New Orleans, or are those rims too thin as well? The Cheyenne definitely is too thin, and there are no windows on the rim. The NO, maybe. We don't really know how thick the rim is on the Cheyenne. If there were windows, it may be possible. The New Orleans is a definite candidate because the overall dimensions were roughly halved (by combining the windows of two decks to one). But there are no windows either. That's a great photo, Johnny! Just what I was looking for to illustrate the model sizes. This is the unmodified image from the Behind-the-Scenes card set. Seems pretty straightforward. Wndows on the dorsal bulge at least, probably ventral, too, but none on the flat rim. Since this seems to be the only photo that exists of the Cheyenne model, I based my whole reconstruction on it. I assumed that the rim is thicker compare to the Galaxy class. I don't remember exactly where the idea comes from though. Anyone have the 1/2500 scale model of the Enterprise-D? Is the groove (the sensor strip) part of the upper or the lower half of the saucer? In the first case, Miarecki may have inserted a gap made of polystyrene strips between the two lower halves he used, because otherwise they would have been flush. In the latter case the gap between the two halves would be naturally wider unless he filed it down. It's part of the upper half. There is indeed a very obvious styrene spacer set in there to make a full deck height. Agreed- there is a spacer there- otherwise the saucer's edge is razor-thin. As to the Observation corridor idea, it's not impossible that there are (Enterprise A sized)porthole-sized windows there that would not show up on so small a model. More likely, the saucer's rim serves as a sensor- something to replace the old ventral sensor on starships like the Connie or Excelsior class. Possibly a targeting sensor for the saucer's phasers, or even the field emitter for the ship's shields (my personal favorite idea). Well, my thinking was that regardless to whether they're on the models or not, the structure is to the right scale so that if someone were to build a proper model (3D or plastic) the details could be added to reflect Probert's corridor concept. after all these were just low detail study models, so there's room for interpretation. Agreed. The 1/2500 scale model simply can't show all the details to make the ship credible. Some bigger models are even less suited for display on screen. *cough* DS9TM *cough*. Well, I'm making a re-creation of this 1:1400 Cheyenne. As a study model, the detial is lacking, but it's fun to fix things. Sanding off the raised shield grid, and scoring it instead. Making a smoother join between the bridge module and the saucer. Adding a narrow "neck" over the bussard coils so there's actually a proper attach point for the nacelles. Things lie that. Add the mottled hull-plate effect, and it'll be pretty sweet. The huge windows on the Galaxy are annoying- the ventral windows are several decks high, while many can only be skylights (or possibly windows for rooms with varible gravity- rooms ar right angles to the door).